It might be fun to tell you that I previously have been a ‘mini’-rider and Suzuki -GX- bought because I was finally old and wise enough to shape my old love! My Suzuki (GL-09-HR), I bought (in June 1985) of the 1st owner of The Hague (he was still white ...) registration Part 1, January 2, 1981, built in 1980. This lady had the car ‘only the grocery's’ and there was 23 000 km on the odometer. After going there for years with lots of fun and trouble had driven in, the car began to show some rust spots (near the rear window, rear window, side sills and above the window frames). I worried for the future !. In June 1989, I gave ‘my Allessie’ (nickname: Ork) off hands for a big restoration turn, then I got him on November 8 as new (in a new color: Mitsubishi Tennessee Blue) back. (See pictures below ′photos/slideshow => metamorphosis′). 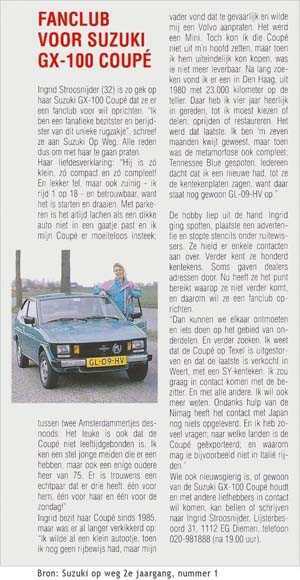 For me that was the reason and the beginning of the Suzuki Coupé GX Fanclub’!. The major restoration included among other things: disassemble whole car, rusty parts are cut out, re-welded, new locks, handles, strips, mirrors, bumpers, fuel filler cap, label held captive, upholstery dry-cleaned, etc, etc. Never regretted it! We hope to achieve the ‘1st 100 members’ this year. Do you want help me to find another Whizzkid-owner? Attached is a ‘Window-wiper letter’. Hopefully we can meet again soon. Any suggestions? We are looking forward to it. But oh what a nice contacts trips, journeys and friendships! A new website is being set up and there are already devised various activities. As you can see in the preamble, the club now has a different name, ‘Friends of the SCGXF’. We hope to be able to expand the number of members again and that we, together with our 'backpacks', can experience cosy meetings.